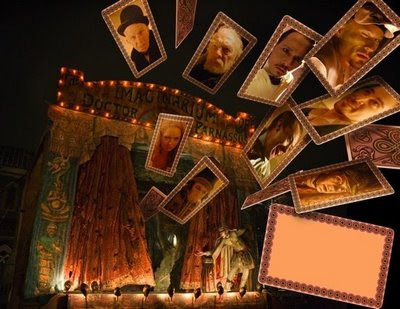 A photo of a teaser poster for Terry Gilliam's The Imaginarium of Doctor Parnassus has been released on various movie rumor sites and I have to say the poster looks pretty impressive. I'm really looking forward to this film. I'm interested in seeing how Gilliam was able to restructure this film after the death of Heath Ledger. Honestly, the movie already sounded fascinating. Then the unfortunate tragedy of Heath Ledger's death unavoidably affected the film's plot. Although for most films this could have been seen as disastrous, the circumstances have forced Gilliam to use even more creativity and visual artistry in telling his tale. Which in my opinion, can turn this troubled project from something potentially really cool into something potentially genius. This isn't a poster. It was created by Nicola Pecorini to be handed out to crew members with an autographed thank you. Nothing more.